I am not bound to win; but I am bound to be true. I am not bound to succeed; but I am bound to live by the light that I have. British East India Company (established in England during 1600) obtained permission for establishing a trade office in Southern India from government of Aurangzeb Alamgir. After about half a century, the company started bringing in British Army personnel in the name of company security and started secretively getting support of Hinu tribes against the Muslim government. Their clandestine activities got accelerated when Mughal government became weak after death of Aurangzeb. By 1750 East India Company had established an army of its own. During 1757, East India Company with the help of Hinu Rajas and a traitor, Mir Jafar defeated Muslim army in Bengal. Later, British East India Company defeated Muslim army in South India with help of Hinu Rajas and a traitor, Mir Sadiq, and established their rule in Bengal and South India. With the decline of Mughal Emperors, East India Company accelerated its clandestine operations and finally attacked the capital, Delhi of Mughal Empire in 1857. In 1858, the reign of government came directly under British Crown. Hindus accepted the British Rule but Most of the Muslims of India considered them foreign intruders as such killing of Muslims continued. All scholars, people of special skills, clergy and influential people were killed by the British Forces, and their properties confiscated. Masajid (Mosques) used to be centres of learning not only religion but also mathematics, physics, chemistry, history, geography etc. These institutions were discontinued, and their properties confiscated. Killing of Muslims and confiscation of their properties continued. As a result, properties of our ancestors spread over several villages in Punjab were confiscated and some of them were killed during 1870s. My great-grandfather escaped with his wife and little kids and took refuge in State Jammu and Kashmir. Youngest child with him was an infant, my Dada (paternal grandfather). they can appreciate the importance of people who have touched their lives. A new study from advocacy group Tax Justice Network reveals that Switzerland is the world’s most-corrupt country, with a “high secrecy score of 76.” It’s followed by the US and the Cayman Islands. “Switzerland is the grandfather of the world’s tax havens, one of the world’s largest offshore financial centers, and one of the world’s biggest secrecy jurisdictions or tax havens,” said the group’s report ‘Financial Secrecy Index — 2018 Results’. It explained that “the Swiss will exchange information with rich countries if they have to, but will continue offering citizens of poorer countries the opportunity to evade their taxpaying responsibilities. “These factors, along with ongoing aggressive pursuit of financial sector whistleblowers (resorting at times to what appear to be non-legal methods) are ongoing reminders of why Switzerland remains the most important secrecy jurisdiction in the world today,” said the report. The index ranks countries for the assistance their legal systems provide to money-launderers, and to all people who seek to protect corruptly-obtained wealth. The higher the secrecy score, the more corrupt the government is. 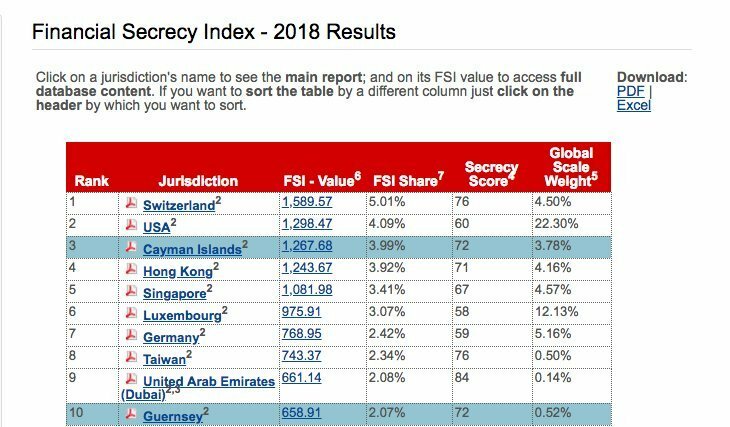 In order to create the index, a secrecy score is combined with a figure representing the size of the offshore financial services industry in each country. According to the report, the United States’ secrecy score (60) is rising, which results in attracting corrupt wealth. In 2013, the US was in the sixth place, and in 2015 it took the third in the rating. “The continued rise of the US in the 2018 index comes off the back of a significant change in the US share of the global market for offshore financial services. Between 2015 and 2018 the US increased its market share in offshore financial services by 14 percent,” said the report. In total the US accounts for 22.3 percent of the global market in offshore financial services. Cayman Islands, Hong Kong, Singapore, Luxembourg, Germany, Taiwan, the United Arab Emirates, and Guernsey closed out the top-10 most corrupt countries. The least corrupt nations among the 112 covered in the rating were San Marino, St. Lucia, St. Vincent and the Grenadines, and Montserrat. The countries with the lowest secrecy score were UK (42) and Slovenia (42), Belgium (44), Sweden (45), Lithuania (47), Italy (49) and Brazil (49). So, take lesson and do not grudge.